As the school year starts and students are bustling to come in, teachers are also actively coming in and out. 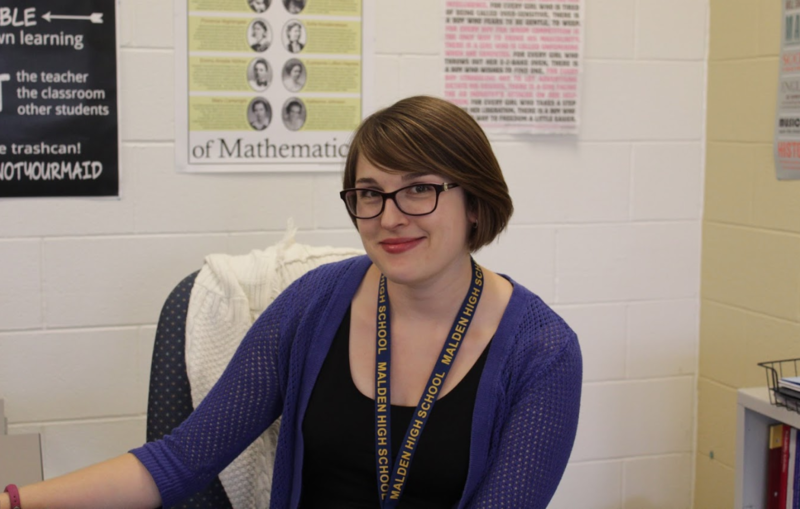 Malden High school has recently welcomed the new Math Special Education teacher, Laura Gould. As a new teacher a part of Malden’s teaching community, Gould has not only been adjusting to the new school environment but also the Malden district as well, as she moved from Somerville over the summer. Since Gould was young, she was never really interested in math as she is now. Gould attended Northeastern for her undergraduate degree where she majored in English and Secondary English Education, then went onto Tufts University for graduate school, and after attended Simmons College to further pursue her career in Special Education while working in Boston. When describing her motivation and urge to pursue this specific field she recounted on how she wants to work with students who may need a little more support. Laura Gould is a new special education teacher at MHS. Photo by Falyn Kelley. Before even arriving in Malden, Gould taught at Waltham and then in a charter school in Cambridge and Boston for middle schoolers. Additionally, she taught abroad in Turkey, teaching English as a second language already, having experiences teaching a variety of students ranging from different ages. Gould has fully expressed on how here, at Malden High, the atmosphere has been warm and welcoming with addition to the “positivity not feeling fake” of which she did not expect for so many staff members to ask how was her day when she first came. One of the reasons why Gould became a Math Special Education teacher was because she has been tutoring math for about 2-3 years outside of school and actually has been able to tutor with another teacher and have the opportunity to review her math skills. She also tutored a variation of subjects such as English and ACT Prep. Gould’s goals for teaching this year would be establishing “purposeful collaborations” with her colleagues and overall just “have everything come together” as this is her first time teaching in a high school environment. Malden High school is very pleased to welcome Gould as one of the new staff members a part of the school community.